The State of The Race: It Was The Best Of Times. It Was The Worst Of Times. How do we reconcile polls results such as those contained in the CNN and Fox surveys that show Obama ahead with the much more pessimistic forecasts by political scientists, such as Doug Hibbs, Campbell and even Alan Abramowitz, based on economic fundamentals? Bert Johnson and I touched on this topic in our latest professor pundits’ video, but I want to elaborate some of our comments here. In a scholarly article written in 1993, Gary King and Andrew Gelman examined why trial heat polls like CNN’s and Fox’s can be so volatile in the months preceding a campaign despite political scientists’ claim that election results are largely dictated by fundamental factors that do not change appreciably during the campaign season. The answer, they suggest, is that many voters who are surveyed several months before an election often really haven’t given much thought to who they will vote for, even though they respond to the question sincerely. That is, these survey respondents over estimate their own certitude regarding for whom they are likely to vote. But their answers this far out are often driven by short-term events, such as media coverage of a candidate’s “gaffe”, or more general perceptions regarding who is “ahead” in the race. These short-term factors, however, are not the ones that ultimately drive the decision for most individual voters. Instead, that decision will be rooted in the fundamentals, such as economic growth as measured by GDP, as interpreted through voters’ own partisan and ideological lens. Although their research is dated, I don’t think King and Gelman’s conclusion are any less applicable today, which is why I caution against paying much attention to trial heat polls such as CNN’s and Fox’s at this stage of the campaign. This is even more so for state- level trial heat polls, which is why I am skeptical of efforts to predict the Electoral College vote this far out, particularly since many pollsters’ likely voter screens at the state level aren’t particularly accurate as yet. More generally, I don’t believe that the relative electoral fortunes of Obama and Romney are fluctuating as much as many voting models based on polling data suggest. As you can see, only Carter had a worse election year second quarter. 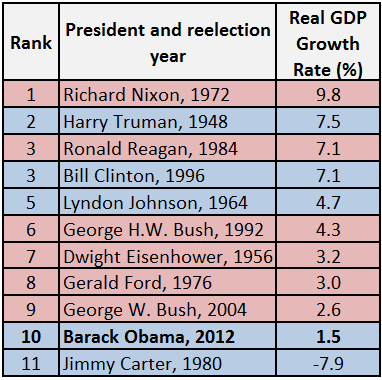 The story is not much better if we look at the average GDP growth for the last 10 quarters; here the GDP figures for Obama are better only than George H.W. Bush’s and the Nixon-Ford quarters. Not all forecasters would agree. As I noted in an this earlier post discussing Doug Hibbs’ forecast model, Hibbs has no use for models like Campbell’s that incorporate trial heat polls or presidential approval ratings because they are essentially adding “noise” the forecast, since both approval and trial heat results are themselves predicated, at least in part, on the economic fundamentals. So where does that leave the race? In my view, the fundamentals that have generally proved reliable in the past suggest that come November, this race will be much closer than the margin suggested by today’s CNN and Fox polls. Although you will undoubtedly hear pundits proclaiming in the wake of these latest polls that we are seeing a potential turning point in the race, with Obama beginning to stretch his lead, the King and Gelman study reminds us that this type of polling volatility is par for the course and likely does not provide a very reliable preview of November’s outcome. 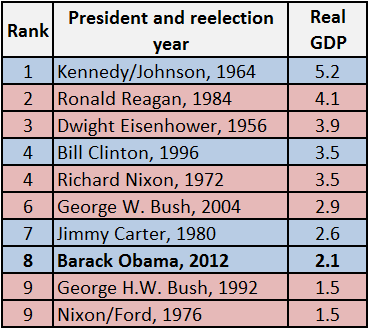 Matt, Campbell’s Q2 estimates rely upon revised data, but he uses the initial estimate for Obama. This is potentially consequential, because real-time data are better for electoral forecasting, and economic data are prone to substantial revision. Eisenhower had ~.3% growth during Q2 in the first estimate and last year the first estimate for Q2 was 1.3, but the most recent revision is 2.5%.